Eleven profound prayers teach you the essence of faith and petition. There are many examples in the Bible of men and women who prayed fervent, effective prayers that God answered. That’s the question: What kinds of prayers does God answer? What kind of faith does God respond to? 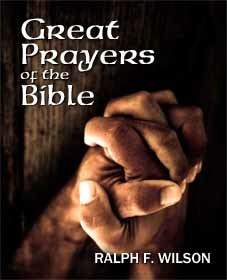 This book examines in considerable depth eleven amazing prayers. Some are short, others lengthy, but each has something important to teach us. You’ll study key prayers of Jesus, Paul, Moses, Abraham, David, Hezekiah, Daniel, and Nehemiah. The aim of this study is to help you develop in prayer, increase your faith, and move you into a new plane of communication with your Father in heaven. However, this is not a course in learning to manipulate God to get your way. It is a study of who God is and how He responds to his children’s petitions. Thus it will help you adopt His own heart as you petition your Father. As you model your prayers and your faith after the exemplars put before you in God’s holy Word, you’ll gradually learn to take your place as one of Jesus’ disciples whose prayers move heaven and earth. The book contains 11 lessons that can be used for personal enrichment and by small groups and classes. Preachers and teachers will also find a lot of their word study research done for them, with a number of illustrations and insights for lessons and sermons. The Lord's Prayer (Matthew 6:5-15). Jesus taught this classic lesson in prayer to his disciples. We'll consider the Lord's Prayer phrase by phrase as a pattern for our own praying. Moses' Prayer for Israel in the Wilderness (Exodus 32:9-14). Incredible examples of Moses pleading with God to preserve his own name and character and not destroy Israel. We examine the question: Does prayer actually change anything? Abraham's Prayer for Sodom (Genesis 18:16-33). An example of intercessory prayer which finds its basis in God's character. David's Prayer for Pardon and Confession of Sin (Psalm 51). When we sin against God, how can we pray to restore our fellowship? David's prayer is a classic prayer of repentance. David's Prayer at the End of Life (1 Chronicles 29:9-20). A short psalm of praise and David's prayer for his son Solomon to build the temple. David's Psalm of Surrender (Psalm 139). David struggles with God's intense knowledge of him, marvels at God's intricate formation of him in his mother's womb, and then prays a prayer of surrender to God's searching, knowing, probing, and refining. Hezekiah's Petitions for Deliverance and Healing (2 Kings 19:14-19; 20:1-7). Here's a godly king about to see his nation conquered and destroyed by the mighty Assyrian army. Then he who has just heard from a prophet that he should prepare to die soon. How does he pray? Daniel's Confession on Behalf of His People (Daniel 9:1-19). When Daniel realizes the 70 years of exile are ended, he offers a prayer of confession in which he (though personally a righteous man) identifies with the sins of his people and asks for God's mercy. Nehemiah's Prayer for Success (Nehemiah 1:1-2:9). Nehemiah hears of the suffering of the returned exiles. After grieving in fasting and prayer, Nehemiah prays for success -- and commits himself to God's will for his life. Jesus' Prayer of Submission at Gethsemane (Luke 22:39-46). Jesus asks for the cup (crucifixion) to be bypassed, but then prays for the Father's will to be done most of all. How do you pray an authentic prayer of submission? Paul's Prayers for the Ephesian Believers (greatprayers 1:15-23; 3:14-21). Here are Paul's prayers for the Ephesian Christians -- and for us -- to really understand the heights and depths of Christ's love for us. You can study it week-by-week in our free online Bible study. But you might like to have the whole study, either printed out from an e-book or as a paperback, to help you keep all your notes in a single place. Why don't you order a copy. The price is right! You can purchase this 178-page book either as an e-book or paperback book. Paperback format, $14.95, must be ordered through Amazon.com and other online booksellers. You may also ask your local bookstore to order it. The paperback book has 178 pages and is 7.5" x 9.25". ISBN 0983231095 (978-0-9832310-7-7). Kindle E-book format, $8.95. You may purchase this version directly from Amazon using one of the links above. This is read using a your Kindle or a Kindle Reader program installed on your computer. It cannot be printed out. PDF E-book format, $8.95 (not printed, but a computer download). You purchase the e-book and can download it within minutes. You can read it on your computer in PDF format if you like, or print it out on your printer. No tax is charged on e-books. The filesize is 2.3 MB. Reprint License, $2.50. Once you've ordered this item, set quantity field for the number of reprints you plan to make and click on "recalculate." One license is required for each additional copy you make beyond the initial book you purchased. This reprint license prohibits sale of the book to individuals outside your local area or congregation.